Can pre-poll sops like giving smart phones with internet connectivity to farmers increase farm income? Last week, thousands of farmers and agricultural workers poured into the National Capital to attract and focus the attention of the Central government to their demands. 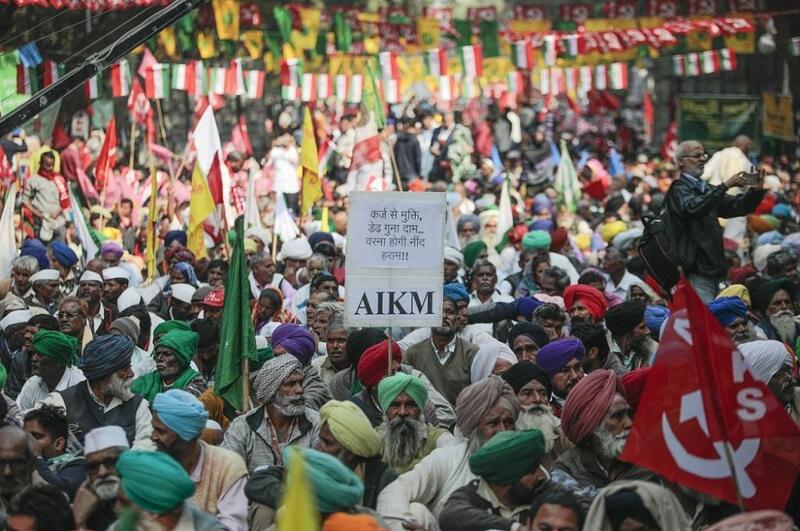 The Mazdoor Kisan Sangharsh Rally, organised by farmers’ organization, All India Kisan Sabha, and the All India Agriculture Workers Union, broke all records as far as crowd numbers go. Farmers from Rajasthan, Madhya Pradesh, Chhattisgarh, Haryana, Uttar Pradesh, Bihar, West Bengal, Himachal Pradesh, Kerala, Karnataka and Maharashtra took part in the rally. But even though the September 5 rally reminded many of Mumbai this February, it did not get as much as attention. So far, the government has ignored their demands to implement the Swaminathan Committee Report, give them remunerative price for their produce, implement loan waivers for poor peasants and agricultural workers, check forcible land acquisition, provide Universal Social Security and protect labour laws. Even as crowds of farmers and workers were marching to Parliament last week, governments in two states, Rajasthan and Chhattisgarh announced plans to make their farmers “smart” by giving them smart phones. Both states would be going to the polls soon. The Vasundhara Raje-led Bharatiya Janata Party government in Rajasthan announced that it would provide free smart phones with Internet connectivity as part of Raje’s poll promise. Only those families who are beneficiaries of the National Food Security Act (NFSA) in the state would be covered. The number of beneficiaries in the state are around one crore families. On September 5, Raje allocated Rs 270 crore for the “Bhamashah Digital Parivar Yojana” scheme, in Jaipur. In Chhattisgarh, Chief Minister Raman Singh announced another scheme called the Sanchar Kranti Yojana, at an outlay of Rs 1,467.90 crores, to provide 50 lakh smart phones to rural households, the urban poor and college students across the state. The state government gave the reason that it wants to increase mobile penetration in Chhattisgarh, a state which is the lowest in India in this regards, at 29 per cent, against the national average of 68 per cent. But the million-dollar question is how will keeping smart phones with internet connectivity raise farm income? The recent study of rural household income by NABARD shows that only 23 per cent of total household income in rural India comes from cultivation and livestock. At the core of farmers’ distress is non-realisation of their produce’s price. The traders’ syndicate in designated markets keeps prices low when produce reaches the market and then supplies it to retailers at higher price. In the current season, the price of tomatoes in Telangana and Karnataka has crashed to Rs 2 per kg while the production cost is around Rs 6-8 per kg. That does not mean consumers have it cheap. They are still paying Rs 20-30 per kg in the open retail market. In order to keep pace with today’s digital era, the Modi government in 2015 launched the electronic National Agriculture Market (e-NAM) scheme. But it is yet to take off. On paper, it has connected to 585 Agricultural Produce Market Committees (APMC). However, it has not come to the rescue of farmers on the ground. Traders and middlemen still control the market, which discourages farmers from using the internet medium to auction their produce. If e-NAM gets a head-start, farmers definitely would use smart phones with internet connectivity to get updates from markets and would be able to auction their produce from their villages. It will certainly weed out unscrupulous traders and middlemen. But it still has a long way to go. The onus is on state governments to break this syndicate and let farmers get benefits from their smart phones. Besides Rajasthan and Chhattisgarh’s “smart phone politics”, Madhya Pradesh and Chhattisgarh have announced that they would pay a bonus on wheat and rice over declared Minimum Support Price (MSP). Madhya Pradesh has announced a bonus Rs 265 per quintal over a declared MSP of Rs 1,735/quintal of wheat in the previous Rabi season of 2017-18. Chhattisgarh has announced a bonus of Rs 300/quintal on a declared MSP Rs 1,750 during the current Kharif season. It is pertinent to mention that Madhya Pradesh and Chhattisgarh used to give bonuses over MSP on rice and wheat in the UPA regime. These initiatives boosted production and also helped in raising incomes of farmers. But the initiative of bonus was removed in 2014 after the Narendra Modi government came to power. The Union government had issued a directive to discourage states like Madhya Pradesh, Rajasthan, Chhattisgarh and Bihar that had announced bonuses to farmers in 2013. After violent farmer protests in 2017, the Madhya Pradesh government started the “Bhavantar Bhugtan Yojana” scheme in the last kharif (2017) to compensate farmers of selected crops for the difference between the realised price and MSP. But that also failed to take off. Meanwhile, the Maharashtra government has passed a law in August to punish traders who buy agricultural produce below MSP. Also, the government of Karnataka has been mulling to kick off another farm loan waiver in order to meet poll promises and prepare the ground for parliamentary elections. Some state governments are taking these pro-farmer steps due to upcoming elections. And while smart phones will be of help in the short term, farmer organisations should maintain pressure on their respective governments to get long-term policy benefits.